The dangers of smartphones in ancient Hellas? Supernatural brings us Gods. Again. On the sixth of the month of Elaphebolion, the people of Athens and Phocis (Φωκίδα), and perhaps other cities and city-states, held a modest ritual that gave its name to the month: the Elaphebolia (Έλαφηβόλια). It appears that the festival was a major festival in honor of Artemis Elaphêbolos (Αρτεμις Ελαφηβολος) down to the time of Plutarch. It was mainly observed at Hyampolis, to commemorate a Phocian victory over the Thessalians. Afterwards, it seems to have lost its grander, most likely in the face of the Greater Dionysia which was held only a few days later, starting on the tenth of the month, and the Asklepia, held on the eighth. 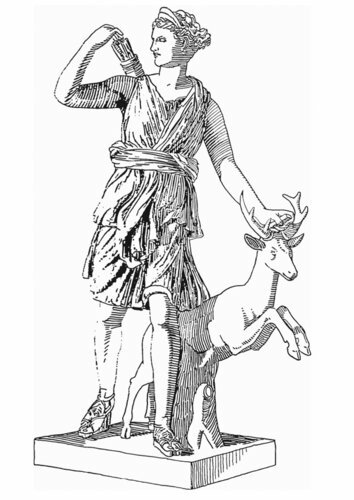 Artemis Elaphêbolos is the stag-killer, the shooter of deer, the huntress, who relishes the chase. She's the slayer of prey, both animal and human, and in ancient Hellas, she guarded Hyampolis and the surrounding cities from the horrors of war. The festival was most likely quite grand right after the war, but slowly became a festival which consisted almost entirely of a single offering. In the early days, the offering was always a stag, one per family, most likely. As the years went on, however, and the expansion of cities drove the stag far into the Athenian hills, only the city's elite was able to offer a stag to the Theia. Everyone else made due with cakes in the shape of stags. It seems these stag cakes--called 'elaphos' (ἔλαφος)--were made out of a basic dough, honey, and sesame seeds. It's always striking to me that Artemis was--and is--worshipped as both a nurse and midwife, as well as a hunter and a Theia who would take lives instantly; especially the lives of women and girls. Apollon, her brother, took the men and boys. Artemis holds the balance between life and death, and she does so without judgement. All who are born must die, eventually. Yet, why offer male animals to a Theia who takes the lives of females? Perhaps it is simply a matter of a prized hunting animal: even to this day, bringing down a stag garners a lot of prestige in the hunting community. Perhaps the stag--as a male--represents active fertility, and to end his in sacrifice to Artemis gives her dominance over the cycle of life and death in some way. Whatever the case, the Elaphebolia was an important festival of Artemis. The 2013 festival day started at dusk on the seventeenth of March, and will continue until dusk today. As Artemis Elaphêbolos is Ouranic, the sacrifice would have been made during the daylight hours. For modern practitioners, reconstructing the sacrifice is relatively easy: stag-shaped cakes, sacrificed to Artemis Elaphêbolos. Various hymns to Artemis have survived which can be recited. In the end, it's about recognizing Artemis' power over life and death on a day sacred to Her. A most worthy reason for a festival, if I ever heard one.